Intel has produced three blazing fast PCIe flash cards using NVMe – and that should upset the PCIe flash applecart nicely. NVMe is a standard way of accessing non-volatile memory, meaning host operating systems need only have a single standard driver instead of specific drivers for each supported PCIe flash card. SATA Express is an implementation of NVMe. All in all, the speeds and feeds are nicely graduated. How do they compare to other PCIe flash cards, meaning Fusion-io, Micron, Samsung, Seagate/Avago/LSI and Toshiba? Samsung (XS17150) and Mikey Micron (P520 PCIe) both have NVMe products in the works; we wrote about them in July last year when an HGST one was spotted in compatibility testing. The chart is not clear cut. 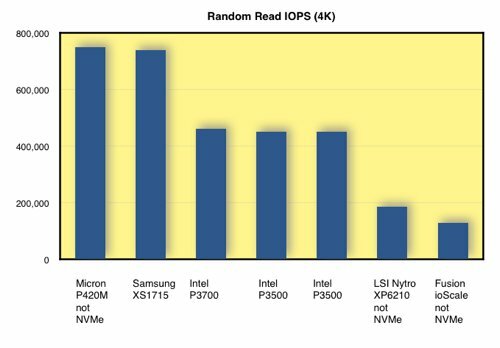 We chose Random Read IOPS but there are only two manufacturers with NVMe cards out in the real world, Intel and Sammy. So we've added in Micron, LSI and Fusion-io PCIe flash cards to provide a kind of limited comparison. All the cards went up to at least 1.4TB. The Micron P420M card is the fastest at 750,000 IOPS, with Sammy's XS1715 close behind at 740,000. Then come the three Intel NVMe products, followed by the LSI (going to be Seagate) XP6210 and Fusion-io's ioScale, both looking outclassed. It is not necessary to have NVMe to get a fast read response off a flash card; Micron's P420M shows that. With Micron bringing out, we understand, a P520M NVMe flash card, we might expect that to go beyond the upper limits of the P420M's performance envelope. 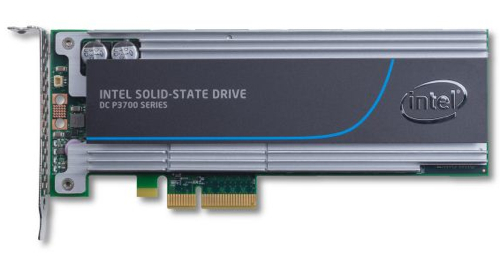 We expect Seagate/LSI and Fusion, and all PCIe flash card manufacturers, to move to NVMe in time. There is a review of these new DC P3n00 NVMe flash cards on the AnandTech website. What went well? Services, services, services, services!